40 Days to Personal Revolution is a 6 week program designed to empower each participant with the training and insight that is needed to achieve breakthroughs. Develop strength, vitality, power, and freedom through meditation, Asana (the physical practice) and inquiry. Whether you are brand new to yoga or are a seasoned practitioner, the 40 Days program will leave you up to something bigger in your practice and in your life. I registered for my first 40 Days not knowing what the program actually entailed. I had been practicing yoga for less than a year, but was coming to my mat almost daily. Prior to finding Baptiste Yoga and committing to my first 40 Days, I had been so stuck in my need to be right, my need to be as miserable as possible because I left my family, friends and career to move to the area and I didn’t want to be here. By about week three, I really felt and saw a personal shift. I realized that I had a choice. To accept my life and my situation exactly as it was and be happy with it or I could continue doing the same things and expecting different results. It was that easy and hard. Through the daily yoga practice, meditation and inquiry, I started on a path of personal transformation and growth. It was also a major factor in my decision to become a yoga instructor. I wanted to share Baptiste Yoga with as many people as possible, in hopes that maybe it would impact their life the way it did mine. Elizabeth M. Schenectady, NY - "When I signed up for the Winter 2017 session of 40 Days, I was already a fan of Baptiste yoga, and I thought I would just be getting a bonus practice each week. What I didn't realize is that after the 40 days were over I would have an incredible new community of friends. This new community became my support system as I navigated through a series of big life changes. The inquiry portion of the program helped me manage my emotions through this challenging time which then opened the door to a brand new chapter of my life. The Baptiste practice has become a foundation for my daily life, and something that I now enjoy sharing with others." Marissa K. Glenville, NY - "As a practitioner for 2 years prior to my first 40 Days to Personal Revolution program, I had come to a point where I needed more from my practice, except I was unsure as to what “more” meant at the time. Soon after starting the program I received the answer I was searching for! The experience began to transition my thoughts around who I am, my integrity, and the impact I can have within all facets (personal/professional) of my life. I received a broader perspective of the Baptiste methodology and a deepened appreciation of how the Baptiste themes, practices, and principles apply in my life on and off my mat. The best part was knowing that each experience is unique to the individual. For me, by doing the work and applying the teachings, I understood that my work had just begun. This foundation gave me the confidence and power to sign up for Level One and Level Two Teacher training(s), to be a stand for my community, and to remain mindful that each and every day is an opportunity to be ME." Brian F. Castleton, NY - "I barely scraped together enough cash, it could have been an excuse, but I made it my reason. A lifetime of never having enough money, love, confidence, time, CONTROL. First off, it was challenging. The instructors were tough, fair, and lead by example. 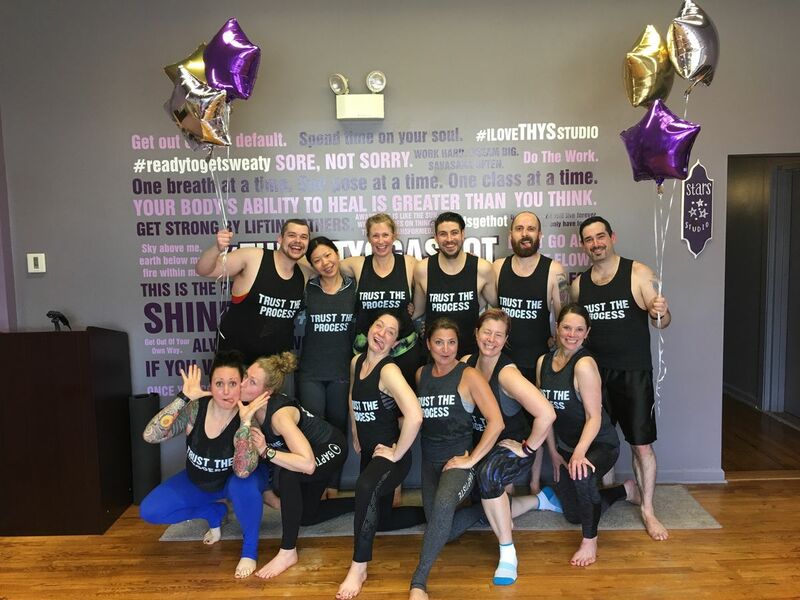 Jess, Tanya & Sheryl really cared about helping us reach our potential, and having multiple instructors meant more individualized attention than a normal yoga class. I learned a lot about the physical practice and why the poses progress the way they do, we learned about a holistic (all-encompassing "Body-mind-spirit-diet") approach to wellness. While all of our goals were very unique and personal, I found a community of people all moving forward together, and that mutual accountability kept me plugged in. Last year during the program I started a business, and 5 months later I found the courage to fire my dead-end fast food job. I find it hard to express in words or dollars how valuable this program has been to me, but I recommend this program for anyone wants to change, and is willing to put in the work to get it. The program works, but only if you DO THE WORK."